In what universe does stealing the corporate image of British Airways and decorating the outside of your hair salon with it say wow I would like to have my hair cut and styled ‘there’ work? The answer of course is in Wales a small country that is not trying to become independent from the United Kingdom sadly! 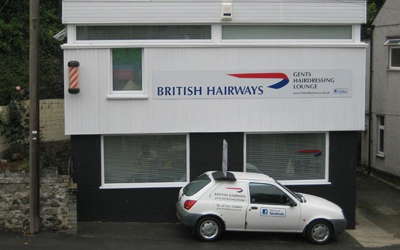 As you can see Wales is a strange place where calling your hair salon “British Hairways” seems like such a good idea! Well what can a Cat say? I think the answer is ‘as little as possible’ don’t you? Wales is an odd country! I have tried for a long while to figure out just what this sign meant – well the bits of the sign that are written in a normal sane language and not the rather redundant and little used Welsh – I have several ideas and here they are. 1. – Sheep Drop – what do the Sheep drop and why are they so clumsy in this area of the Welsh mountains? 2. 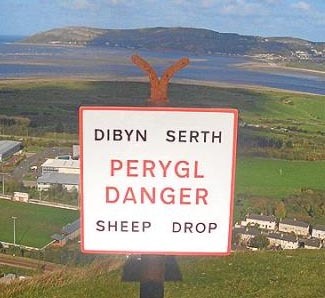 – Sheep Drop – a danger area for Sheep especially short sighted Ewes. 3. – Sheep Drop – yep! That’s right just tip any unwanted Sheep over the edge. And now just to torture you here are the sentences above in Welsh! 2. – Defaid Galw Heibio – ardal beryglus ar gyfer defaid yn enwedig byr Mamogiaid ddall. 3. – Defaid Galw Heibio – yep! Mae hynny’n iawn yn unig tip unrhyw Defaid diangen dros yr ymyl. 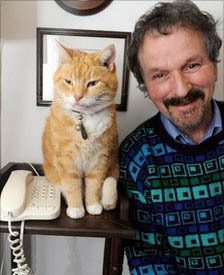 If you want to know what my name is in Welsh sadly it is rather boring – Mae Cat obviously ‘Cat’ is ‘Cat’ in Welsh and ‘the’ is ‘mae’ which you have to admit is very mundane where as ‘The Cat’ in Czech is ‘Kočka’ now that sounds like a word with possibilities doesn’t it?